Our 2017 Holiday Hampers programme is finished and we want to send a huge thank you for all of the donations and to our volunteers for pulling together these wonderful hampers. 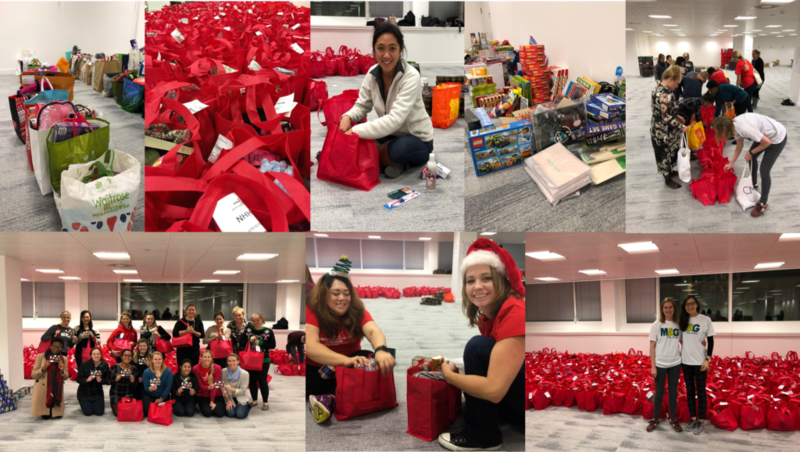 For the 21st consecutive year and over the course of 3+ weeks, our volunteers prepared 732 personalised hampers filled with food, toiletries, gifts and other essentials for some of London’s most vulnerable populations during the holiday season. This year we worked with 10 partner agencies to distribute hampers to 1,257 individuals, 441 of whom were children. The feedback we’ve received is humbling and heart-warming. Magdis that ‘thank you very much’ over and over again. Helen gave us a big smile and was very shy but said thank you and her child was bouncing around delighted with the box and dying to open it. Bridget said that her son will be delighted to get a lego set. Amos’s mum thanked us and was very pleased with the winter food. She said she had a painful back so carry shopping is difficult so this gift gives her a break. She said she ‘blesses the team who work so hard to help the community in need’. Zebadee’s mum exclaimed what a big box it was a wished us Merry Christmas. Emma’s mum said it was a lovely surprise. Harry’s mum gave the biggest smile from ear to ear and repeated thanks many times. Elsa and Amy’s dad gave the thumbs up and said he was happy to have something to give the kids for Christmas. Ebony’s mum was delighted and exclaimed about how big the box was. Jessamy’s children were jumping up and down with excitement and said thank you very much. Have a look at pictures from this year’s Hampers campaign and you can read more about our programme here. We’d love to have your support for 2018!